Google released a demo for a speech-to-text technology that allows you to search inside a video's content. You can add an iGoogle gadget that is restricted to a small number of political videos from YouTube. Since the gadget is actually an iframe, you can also go to the original page. "Using the gadget you can search not only the titles and descriptions of the videos, but also their spoken content. Additionally, since speech recognition tells us exactly when words are spoken in the video, you can jump right to the most relevant parts of the videos you find," explains Google. 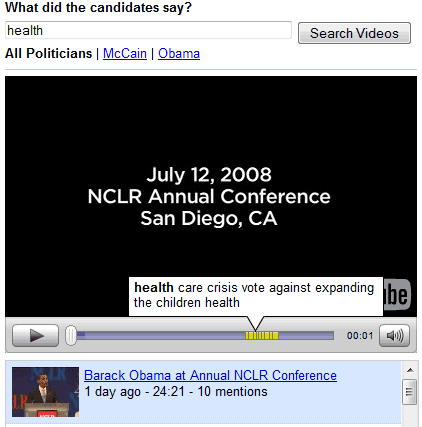 EveryZing uses speech-to-text technology to search for audio and video across the web. The site has a separate section for YouTube videos, but the coverage is unimpressive.